The Goat orchid produces a beautiful flower that, despite the name, in fact looks a little like a horned bee. It is because of these horns that this orchid is also often referred to as the Goat Orchid. This orchid is actually a part of the bee like orchids family but some scientists and botanists like to classify it separately. Historically the Goat orchid was found in many different places around the Mediterranean. Today it can be seen growing in regions like the Balkans to Macedonia and Anatolia as well as in countries like Iran and Iraq. The Goat orchid is not a common orchid but, in places where it is found, it can grow in large numbers in the form of colonies. Goat orchids belong to the family of orchids that are relatively tall and, as such, its plants can grow up to a height of 60cms. It grows quickly in soil conditions that are slightly acidic in nature – thus the prevalence for Mediterranean locations. 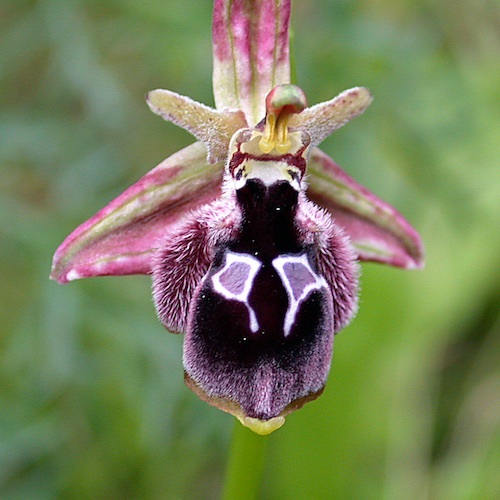 Despite this the Goat Orchid is not a great fan of full sun and tends to be found growing in areas with some woodland shade provided – often in or near pine forests. The resulting fallen pine needles and pollen mean that the flowers are often hidden or even marked however they also contribute to adding the acidity to the soil that the this orchid loves. The plant, once it starts to bloom, can hold up to 10 flowers on a single spike. Usually each stalk will produce anywhere from 2-10 flowers. Goat orchid flowers will start to bloom during the warmer months in spring. People have been successful in growing these orchids in their gardens under direct sunlight however their preference is for coniferous woodlands. This means that the best blooms and hardiest of the species are not usually found in the home garden. For this reason also, photographs of the flower are less common.